BMW owners across the country are asking how their parked car could catch fire. 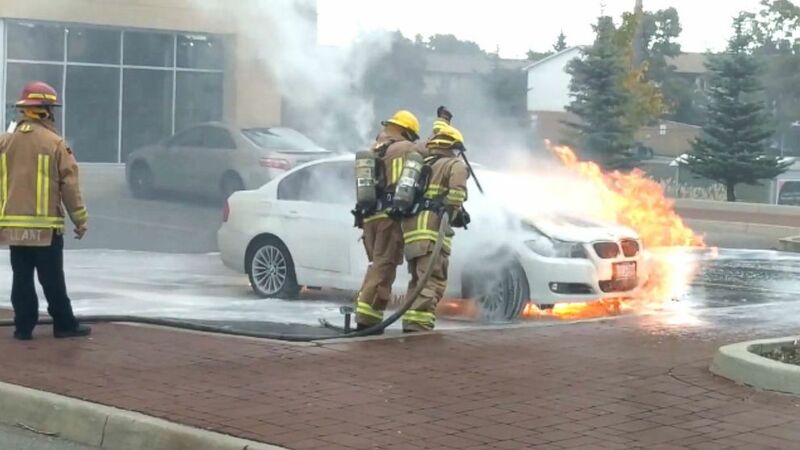 Vehicle owners and fire departments across the country are asking BMW to explain how some parked cars could suddenly burst into flames. An ABC News investigation airing today on Good Morning America, World News Tonight with David Muir and Nightline discovered dozens of incidents in which the luxury cars caught fire even though owners reported they had parked their cars and turned them off. For one such owner, Bill Macko, BMW wasn’t just a car. It was an identity. The 55-year-old small business owner says he had bought seven luxury vehicles from the German automaker since 2000. He was a dues-paying member of the BMW Car Club of America, so he read BMW magazines, carried BMW luggage and wore BMW clothes. He was such a BMW enthusiast that he became, he says, a kind of unofficial brand ambassador, introducing so many new customers to the local BMW dealership that the salesmen occasionally cut him a check for his services. On the night of Dec. 1, 2015, however, Macko says his 2008 BMW X5 suddenly and inexplicably caught fire as it sat parked in his garage in Olney, Maryland. Macko’s wife had just returned from a short drive, parked the car and turned it off. 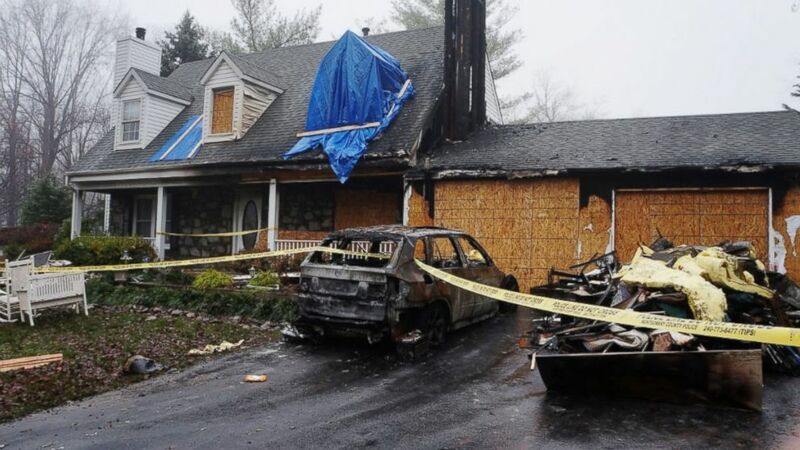 She entered the house and told Macko she noticed a strange smell in the car, and when Macko walked into the garage to check it out, he arrived just in time to hear a “snap, crackle, pop” and see the car burst into flames. Macko and his wife ran from the house as the fire engulfed the garage and spread throughout both the lower and upper floors. Dozens of firefighters arrived to battle the blaze, and the Mackos watched, from a neighbor’s yard, as their home burned to the ground. Macko had brought the car in for service at the dealership just days before, so he initially thought the fire had been caused by the new battery the mechanics had installed, but once the fire was out, he got another surprise. He learned he’s not the only BMW owner to be left asking questions in the wake of a mysterious fire that started after the car was shut off. (Doug Terry) Bill Macko lost his car and his home when his 2008 BMW X5 ignited in his garage. Like many car manufacturers, BMW has issued recalls over the years for fire-related problems, but an ABC News investigation launched in collaboration with ABC-owned stations in New York, Los Angeles, Chicago, San Francisco, and Raleigh, found more than 40 fires occurring in parked cars across the country in the last five years involving vehicles that did not have open recalls for fire-related issues. Fire officials in Westchester County outside New York City told WABC-TV they were stunned when they learned how long a 2003 BMW had been sitting parked before it caught on fire. According to KABC in Los Angeles, a 2011 BMW parked overnight caught fire last month, damaging the car but sparing the Darth Vader costume its owner Steve Copeland wore in performances at children’s charity events. ABC News Fixer: Is your car under recall? Here's how to check. And WTVD in Raleigh spoke to Danielle Emerson, a mother of three, who says she was sleeping when her 2011 BMW caught fire in her garage but sprung out of bed to battle the blaze with a garden hose until fire engines arrived. But even as BMW owners and fire departments around the country have raised concerns about these alarming incidents, several BMW owners -- including car club member Macko – told ABC News that BMW gave them the cold shoulder after the fire. (Obtained by ABC News) Taz Zaide said that his 2011 BMW 3-series caught on fire about five minutes after he had parked his car to go to work. A spokesperson suggested several other potential causes of car fires other than a manufacturing defect, including a lack of maintenance, improper maintenance by unauthorized mechanics, aftermarket modifications, rodent nesting and even arson. According to auto safety expert Sean Kane, the founder and president of Safety Research & Strategies, the risk of car fires is not an uncommon problem, but they usually occur in cars that are in operation. The mystery of car fires that start after the engine has been turned off, Kane says, may stem from the fact that modern vehicles are never fully powered down. In South Korea, however, the government is taking action. Korean safety officials launched an investigation after a series of car fires involving BMWs -- some parked, some not – attracted sustained media attention. Koh Sungwoo, a South Korean transport ministry official, told ABC News that BMW initially suggested that one of the causes of the fires may have been poor maintenance by unauthorized dealers before acknowledging a fuel line defect affecting some diesel cars. The company issued a recall covering those cars, but the government investigation is still ongoing. Koh said that while poor maintenance and defective fuel lines may explain some of the fires, they do not explain all of them. 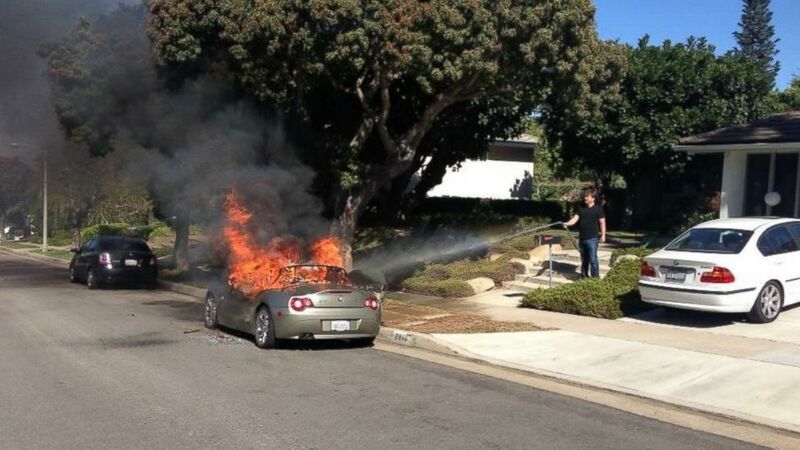 (Obtained by ABC News) Brandie Macias told KABC-TV that her 2005 BMW Z4 spontaneously caught fire in the middle of the afternoon while it was parked on the side of the street. Joseph Santoli, a New Jersey-based attorney who has sued BMW in the past, believes “it’s a pattern that BMW is uniquely qualified to remedy,” but so far, Santoli told ABC News’ Brian Ross, “they have not.” Several angry BMW owners, Santoli said, have contacted him to explore their legal options. BMW has offered a discount on a replacement vehicle to some owners; in other cases, the company has paid cash settlements, in which case the company has insisted vehicle owners also sign a non-disclosure agreement. The company says those “goodwill offers” are just “good business to provide support to our loyal customers.” BMW insists non-disclosure clauses are executed “to ensure that each incident is evaluated and then appropriately resolved on its own merits,” but Santoli believes the true intention of the arrangements is to ensure that the public is less likely to hear about a potential problem. Bill Macko, meanwhile, still isn’t sure when he might be able to return home. He and his wife have been staying with relatives while the rebuilding process inches along at what feels to him like a glacial pace. Asked if he would ever feel safe enough to park his car in his garage again, Macko said he would. ABC News' Laura Sanicola and Taylor Harris contributed to this report.